Home / FAQs / How is Emirates’ First Class Lounge at Dubai International Airport? How is Emirates’ First Class Lounge at Dubai International Airport? The First Class Lounge at Dubai International Airport is a cocoon of relaxation on ground. The areas for dining, work, relaxation and entertainment on the floor are elegantly defined. 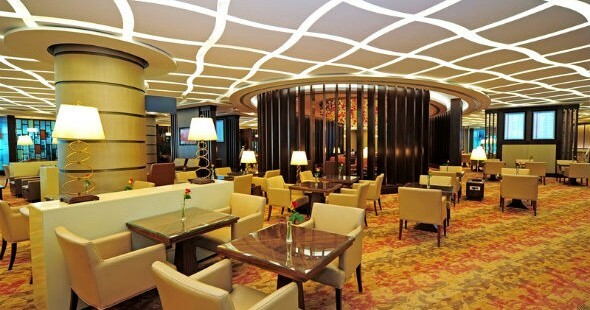 Those who idle away time over food will have a pleasant experience in the First Class Lounge. The guests are treated to a la carte menus which list delicacies from multiple different cuisines. The content of the menus is deliberately chosen keeping in view the tastes of travelers from different parts of the world. Emirates’ First Class Lounge at Dubai International Airport offers an exclusive selection of wines and hot beverages. There is a dedicated wine cellar, the Le Clos on the floor. Wine experts help guests pick up the best vintages according to their individual tastes. Apart from exotic wine and champagne, fruit cocktails add a zing to the spirit of the waiting travelers on ground. If you want to be at work while waiting for the boarding time of your departure or connecting flight at Dubai International Airport, the First Class Lounge is the right place for you. The lounge has all the possible amenities in place for the guests at work. The workstations consist of touchscreen computers with Internet connection, and printers. Access to complimentary Wi-Fi is available all over the lounge. The lounge has fully-equipped conference rooms for corporate travelers. Emirates’ First Class Lounge offers several entertainment options. You can choose according to your mood and comfort level. You can tune to news, sports or movies on TV screens. You can relax over newspapers and magazines in the reading zone. The lounge offers a selection of 70 newspapers and magazines in different languages. Travelers with children will have a good time in the First Class Lounge at Dubai International Airport. The lounge has a children’s play area with a good selection of games and toys to keep children engaged. There is a large plasma screen for children’s entertainment. The lounge has a special food corner for children’s gastronomic refreshment over stomach-friendly menus. Spa service with shower is available in private bathrooms in Emirates’ First Class Lounge. The spa service area is spacious and bright. The bathrooms are equipped with brand toiletries, hairdryers and luxury towels. Note: Emirates’ First Class travelers can retire to the comfort of the First Class Lounge at Dubai International Airport while waiting for the boarding time of their departure or transit flights. The services available in the First Class Lounge may be revised at any time. IndianEagle.com is the only travel agency that books the cheapest flights with Emirates from the United States to India. You are welcome to approach our travel specialists with your queries about Emirates’ services if you have booked your trips through us.